The historical city Pula is situated at the southwest end of the Istrian peninsula, Pula is an excellent base for a Holiday in Istria, the hotel offer in Pula includes the whole range from small family run hotels to large wellness hotels with excellent facilities. Hotel Horizont Pula is situated 3 km from the city centre in Pula and only 1 km from the holiday resort Verudela, the Apartments of the Horizont – Golden Rocks Resort discretely and harmoniously blend into the luxuriant Mediterranean vegetation, scattered over the peninsula that slopes towards the crystal-clear sea. This Croatia family holiday resort’s fragrant Mediterranean park is covered with paths and trails, promenade benches with a view of the open sea, offering delightful moments in the harmony of nature and architecture. It is an ideal place for those seeking rest and relaxation in nature’s embrace. Hotel Palma in Pula is situated 4 km from the city center of Pula, in the resort area called Punta Verudela, the city centre is easy reachable by bus alternatively the active guest can walk along the sea promenade. Hotel Palma is next to the Verudela Channel, with Marina Veruda and Pula’s little port Bunarina on opposite sides of the channel. The view presents a contrast between traditional and modern, local and contemporary, fishing and nomadic, nautical perception of the sea. It is part of the Punta Verudela resort, offering an ideal Istria holiday destination with its combination of accommodation comfort and all other amenities of a fully equipped tourist complex. Hotel Histria Pula is a 3 Star Hotel situated 4 km from the city center of Pula, Hotel Histria represents the symbol of Pula’s tourist offer. Situated in a wonderful location dominantly raised above the seacoast, this hotel resort is the ideal choice for Croatia short breaks with its elegance and comfort, focusing on complimentary facilities – congress, entertainment, sports, recreation… The Hotel Histria is the permanent Croatia active holiday destination of many celebrities from the world of music, film, sport and art who appreciate this combination of luxury and comfort. The Splendid – Golden Rocks Resort is situated in the area known as Golden Rocks (Podstinje), on the magnificent rocky coast that gently slopes towards the sea. The hotel offer excellent facilities which of course include a nice outdoor swimming pool. Most of the apartments have a view of the open sea and Lungomare, Pula’s popular seaside promenade. Only a few steps from the sea, harmoniously blending into this fragrant Mediterranean park, this Croatia family resort provides an ideal setting for family rest and relaxation. On the very hilltop of this tourist complex is Fort Bourgignon, dating from the Austro-Hungarian period, an example of magnificent architecture that adds a breath of history to your Croatia family vacation in this resort on the Adriatic. Hotel Park Pula is one of the few All-Inclusive hotels which can be found in this area, the hotel is surrounded by marvelous Mediterranean vegetation, the Hotel Park has a beach by the sea, which, depending on the time of the day, gets wonderful colors and is very near a deep natural sea cove. 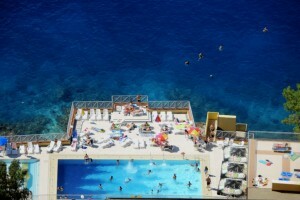 This all-inclusive Croatia hotel is an oasis of peace and tranquility within the Punta Verudela Resort. The Hotel is located 4 km from the old town centre of Pula, guest of at the Hotel Park has a wide range of facilities at their disposal this include WIFI, several bars and restaurants as well as two outdoor swimming pools. Spend a holiday in Pula Croatia Holiday Apartments at the Verudela beach apartments in Pula, The idyllic peace and tranquility of the Verudela Beach Apartments, harmoniously set among pine trees and Mediterranean medicinal plants, will make your holiday a delightful experience immersed in nature. Most Croatia holiday rentals offer a splendid and soothing view of the open sea, only a few meters away from the Mediterranean vegetation and seaside promenade. These Croatia holiday apartments are the perfect holiday destination on the Adriatic for families with children and all who enjoy the sun, sea, entertainment and wide range of facilities of the Punta Verudela tourist resort. 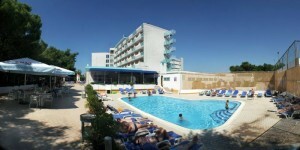 Hotel & Resort Brioni in Pula is situated 4 km from the city center in Pula, at the Holiday resort Verudela. Hotel Brioni has a reputation as at comfortable hotel suitable for people looking for a relaxing holiday surrounded by green Mediterranean vegetation and is connected to the sea by terraced beaches. Hotel Brioni is also an ideal venue for Croatia events, business meetings, promotions and conventions where even a business stay offers a chance for a perfect holiday on the Adriatic. Guest House Hotel Riviera Pula is Situated only 3 Km from the Airport in Pula and fairly close to the city centre which makes the hotel an excellent choice both for business and pleasure. Unique in its elegance and attractive location – this magnificent building in the neo-Baroque style from the end of the 19th century is situated in the historic centre of Pula, close to the Roman amphitheater, the Arena. among the Hotels in Pula, Riviera is beyond doubt a bit different, the hotel is situated just next to the Pula Arena which gives guest the Spirit of Pula and the Mediterranean. Hotel Pula is a recently renovated 3 star hotel situated 2 km away from the historical city centre, Hotel is open whole year and has 172 double rooms and 8 suites. Our hotel is centrally located to make everyone’s stay enjoyable. Hotel Pula is meters away from beautiful green forest leading to a spectacular pebble beach. The hotel environment is very clean with always friendly staff. We are 100 meters away from a series of beautiful beaches, a triathlon jogging trail, within walking distance of 12 tennis courts, 2 football (soccer) fields, a multifunctional sports centre and much more. The environment is ideal for sport clubs training and preparation. The Punta Verudela Resort Pula is situated 4 km from the old town of Pula, the resort resembles a typical coastal town and such a stay amidst Mediterranean style architecture is the perfect holiday choice. This Pula beach resort offers an enchanting combination of supreme comfort and hospitality, which makes you feel completely at home. This is an ideal place for an active Pula resort holiday for families with children and all who want to enjoy the daily rhythm of the sun and sea, nightlife, as well as a wide range of entertainment and sport activities. Apartment at the resort are available in sizes from 25 to 65 m2.